What a fun week I had with Randy from Barrister’s Block! We visited the Coastal Botanical Gardens, shopped at a specialty wool shop, Attic Heirlooms, shopped at Alewives Fabrics who specializes in modern and whimsical prints, did some antiquing, took our boat for a dinner cruise to Boothbay Harbor, had dinner another night at our summer house on the ocean, had a LONG and fabulous visit with Cyndi at the BusyThimble, and oh yes – we went to the quilt show (Maine Quilts 2017)! All these wonderful adventures and when we got up Saturday morning to leave for the airport, we realized we did not have one picture of us together! So, here we are saying goodbye. I was so busy having fun I took no pictures at all except for a few at the show. One of the exhibits I was in was an invitational "Ruby" challenge to celebrate the 40th anniversary of the show. We were all given a traditional pattern from Ruby McKim's 101 Patchwork Quilts (one of my first quilt books in high school). We were to make a traditional 4 block quilt with the red and white fabric provided and then come up with something totally "ours" for the second quilt. It was a fun exhibit. Here are my two. I named my "interpretation quilt", "Forty Years of Fun" and made 40 yo-yo's with fabrics from quilts I had made over the past 40 years. 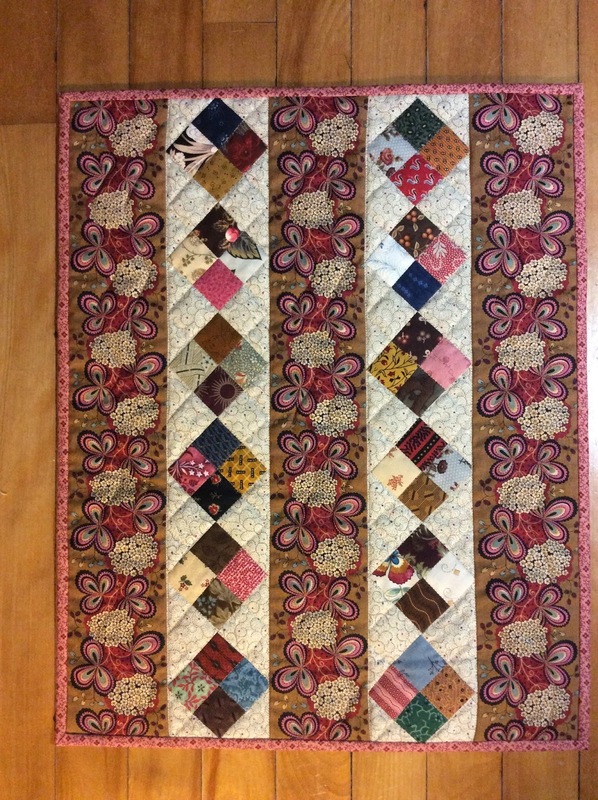 The rest of the quilt is made from vintage feedsacks in my collection. Fun! No, I did not hand embroider the rick rack. I was asked a dozen times, so I thought I should clarify - wink! Cute though, isn't it? I think my favorite in this exhibit was Carol Petinelli's. She chose Spider Web and look at her interpretation. So cute, including baby spiders hanging from beaded spider webs! I wish I had been better about taking photos! I did take these of one of my favorites by Carolee Withee. Isn't she amazing! She won first place and Best Embellishment - no surprise! Do you see the shade pull in the middle? It represents being inside the parlor looking out at the garden. 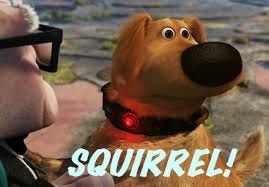 Such vision! Carolee also has a knack for entertaining. She does lectures on her method of saving old linens and making them into quilts accompanied by many of her own songs about the process. She is one of the sweetest people I know! 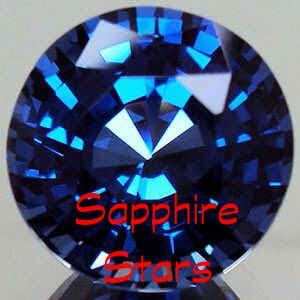 Congratulation Carolee! I put my "Pot Luck" potholder in the display - not the judged section - area and it won a ribbon anyway! It is an NACQJ award from Mary Derry. I was thrilled! 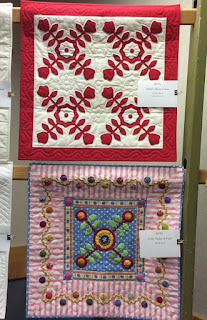 I also won 3 ribbons for the one I put in the judged section, but I can't show the photo because it is my quilt from the Shenandoah Valley Botanical Album Quilt sew-a-long. 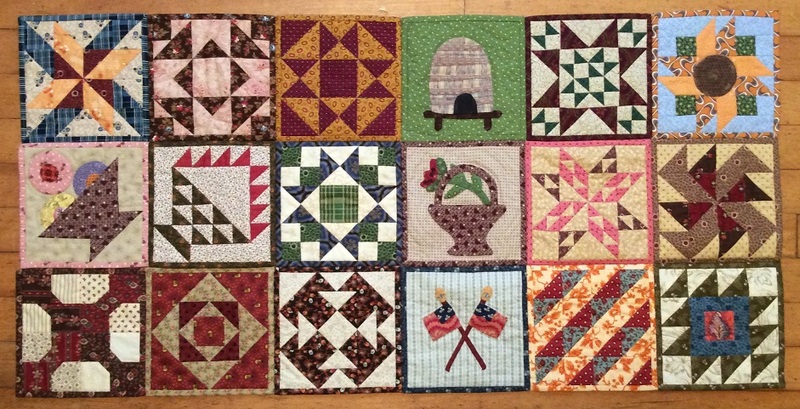 I had permission from the museum to hang it in the show, but the organizers of the sew-a-long, Doreen (Aunt Reen's Place) and Dawn (Collector With A Needle) have asked that we don't publish our finished quilts until after the entries for the upcoming exhibition have been chosen. 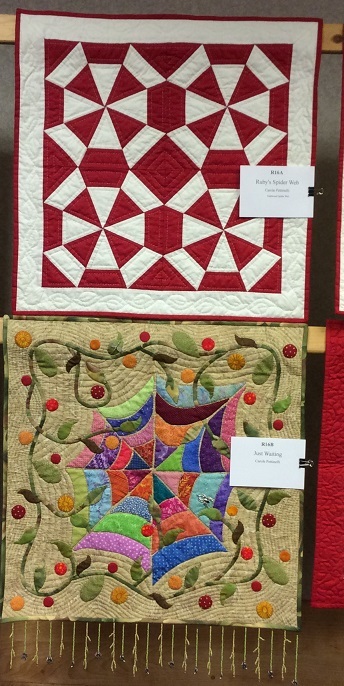 I won first place in applique, Best Hand Quilting and Judge's Choice from De LeClair. I am thrilled with any ribbons I receive, but am most proud of a Viewer's Choice or Judge's Choice. To me that means that at least one person liked my quilt a lot. 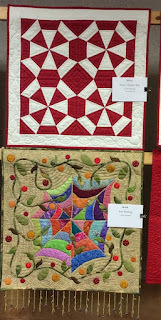 I also love winning ribbons for my potholder quilts because it draws the crowd to the quilt and thus they become curious about the "method". I like to spread the cheer! Thanks for a great visit Randy! I hope we have many more visits to come! 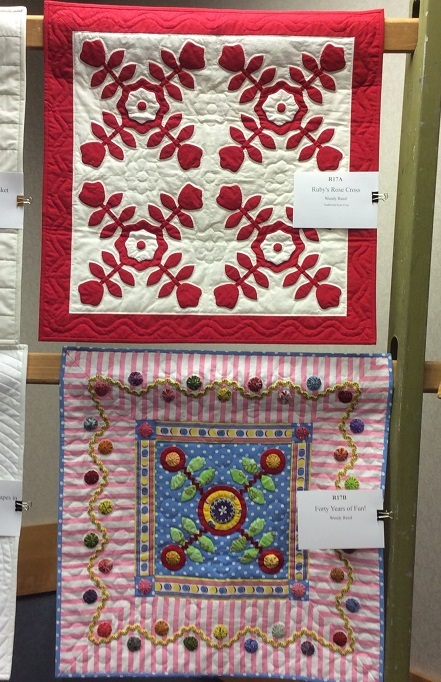 Our annual Maine Quilt show is coming up – July 26 – 29 at the Augusta Civic Center. Click (here) for more details. I’ll have a few quilts there, but can’t reveal the challenge ones until after the show. 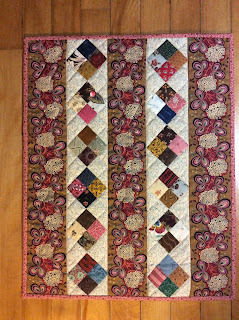 I can show you a few little quilts I made for our auction. This year’s recipient will be the Maine Cancer Fund. This year’s show will be extra special for me as Randy from Barrister’s Block will be visiting. It is always nice to see “our show” through someone else’s eyes. I don’t think she will be disappointed! Hope to catch up with a few of you there! I feel it is very fitting for the final block in this fun sew-a-long is the Rainbow block. The rainbow has become a symbol for embracing diversity. People have really shown their individuality in this SAL. There has been a tremendous amount of creativity in the various blocks each month. I had a bit of trouble visualizing an upside down rainbow, so I made a double right side up rainbow instead (showing my individuality). Since I have changed the orientation of some of the blocks anyway, I thought Esther wouldn’t mind. The fabric choices people have made have been so much fun to watch. There are 1930’s fabrics, wools, batiks, and fussy cut florals. 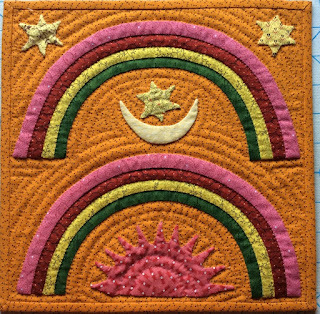 The techniques have been varied as well; machine applique, buttonhole stitched (hand and machine), needle turned, and more. There are quite a few utilizing the quilt as you go method and a few (like me) are using the potholder method. I am so excited that they are planning an exhibition beginning in May, 2018. If you have been sewing along, I hope you are considering submitting your finished quilt for this wonderful exhibition. More details to follow on the Shenandoah Valley Botanical Album blog (here). 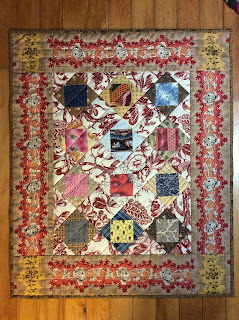 I have enjoyed this project immensely and I would like to thank Dawn (Collector with a Needle) and Doreen (Aunt Reen’s Place) for hosting this 25 block sew-a-long and for keeping us all motivated. 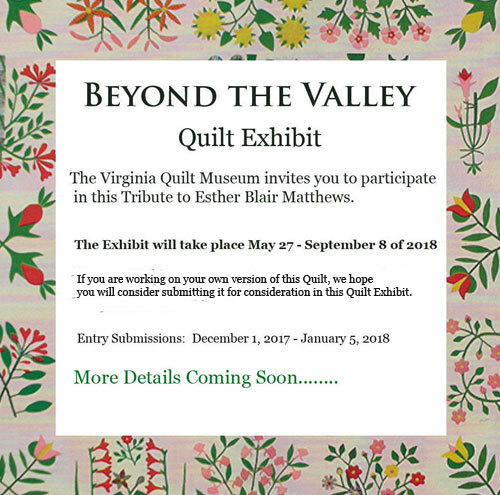 A big thank you to the Virginia Quilt Museum for publishing this pattern and allowing us to share our progress with others. 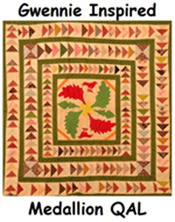 And lastly, I would like to thank Esther Blair Matthews for her artistic vision and impeccable skill in the making of this quilt in 1858. 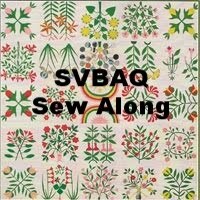 Please check in with the link (here) and enjoy all the unique quilts. Now what? I have already started another long term applique sew-a-long. With the wonderful patterns from “Collector with a Needle" (here) I am venturing down the Noah and Matilda road. Nothing to report yet, I’ll keep you posted. Wink! It seems I am always a week behind, but row 3 of my Blockhead quilt is now complete. I’m glad I decided to do this in the potholder method, as I think it is keeping me motivated to finish each block each week. And, with this method, the back is often as fun as the front! I’m also happy that I decided to set them in order of publication. I like the fact that since there are 6 designers, each one is represented in vertical rows. But, more importantly, it keeps me from having to think about how to set them together – no math and no creative angst! I have used mostly BetsyChutchian and Jo Morton fabrics with a few others thrown in. I want to keep the scrappy feel so I am pulling from my scrap baskets too! Check out all the progress (here) or on their Blockhead Facebook page. They have a gazillion (yes, I counted) followers! I’m not sure how it happened, but I took on yet another sew-a-long project for the summer. 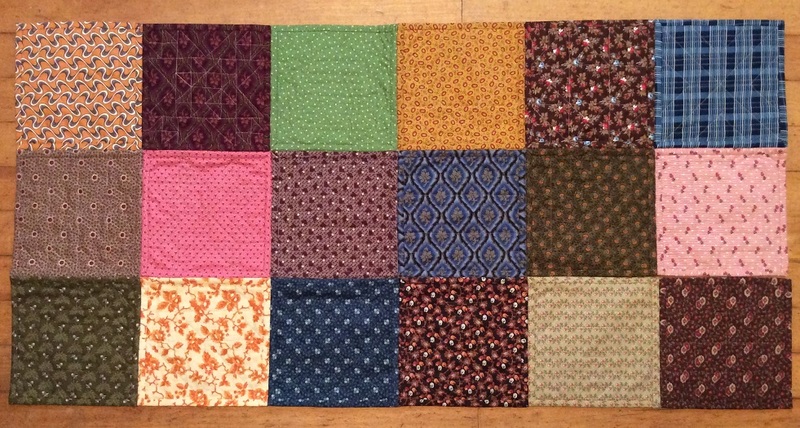 I joined in on my very first mystery quilt adventure. 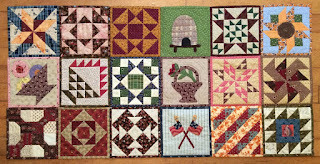 For years I have watched my friends participating in these mystery quilt projects. I just didn’t see the allure until Kevin of Kevin The Quilter in his whimsical way, just made it sounds so enticing. So, here is my first part. Forty eight units done and waiting for the next clue. Woohoo! Kevin’s instructions said to draw a line down the center and stitch on the line. But, being the lazy time efficient person that I am, I just used my little vintage ruler as a guide as I stitched along. The metal ruler has a little camber in it so it makes it easy to keep in place. Do check out Kevin’s blog (here) to see all the progress. Fun, fun, fun!